is great fix to all hunger pangs! 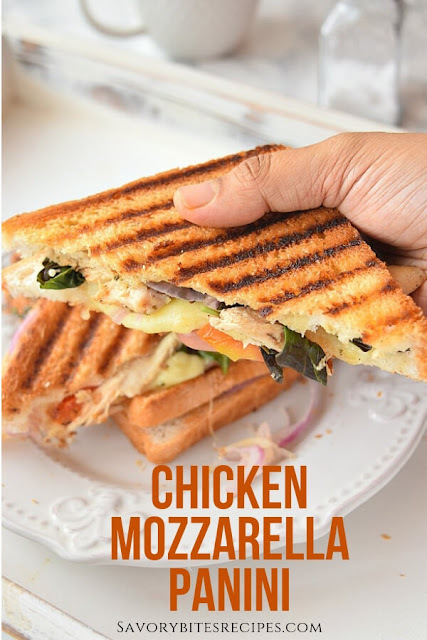 Here is another recipe that will sort out Lunch Box/ Dinner in no time for you,another recipe under 30mins and so good - very easy Chicken Mozzarella Panini. I was looking to make my favorite Grilled Cheese which I had shared before. Do check that out , but wanted Chicken also along with sandwich too so finally sorted to make this superbly crispy,cheesy ,Chicken Mozzarella Tomato Basil Panini. 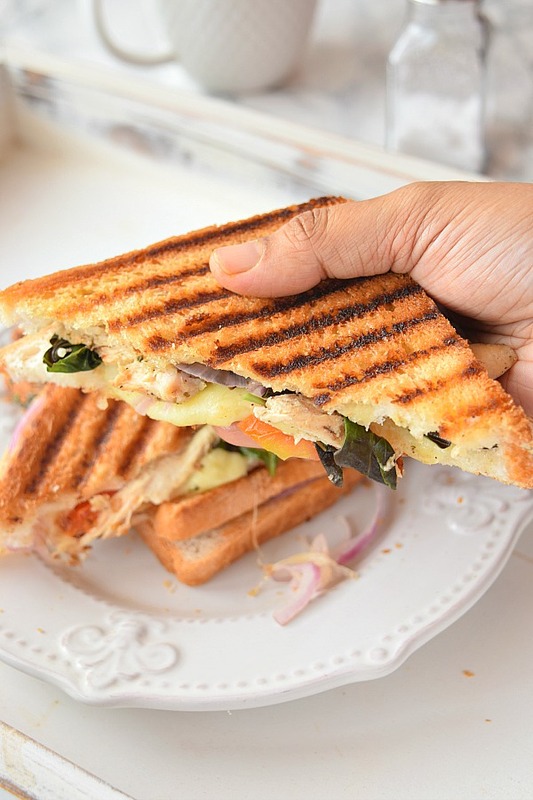 Basil adds amazing flavor to this sandwich that you just can't skip it,even if you have never tried Basil in a sandwich still I would suggest go ahead and have it in this sandwich and this will be your regular. To add chicken to the sandwich,I have marinated it with salt,ground black pepper and Italian seasoning. Roast it or fry with olive oil and make pieces lengthwise to add to the final dish. You can grill or fry chicken to be added as per your personal choice too. Adding caramelized onion gives great flavors in wraps or sandwiches. I had tried adding caramelized onions in Tandoori Egg Wrap which I have shared before. Please check that out too. Here I have not caramelized the onions but you can try that too. I have marinated the Chicken with ground pepper,salt and Italian seasoning. Shallow fry the chicken with olive oil till done,then let it cool and cut into lengthwise pieces. Apply butter to the slices of bread on the side which will be inside of the sandwich. 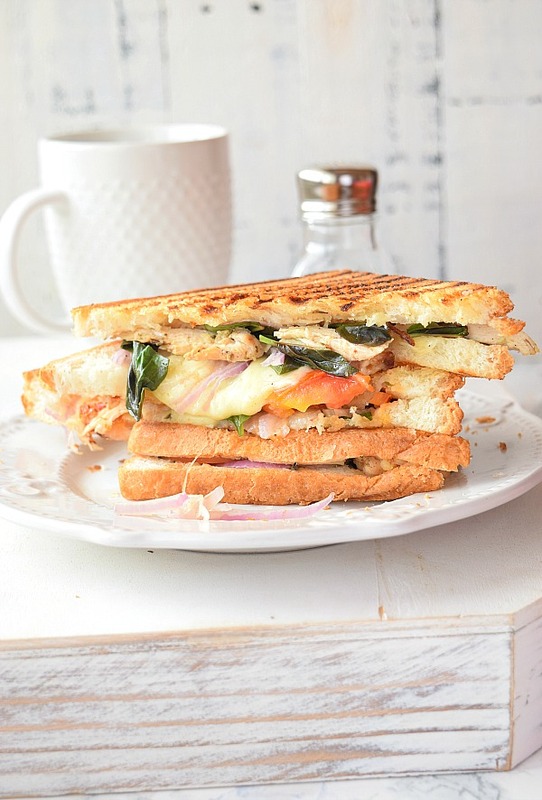 Add the chicken,tomato slices,onion,basil leaves,mozzarella and use a Panini Press Sandwich Maker or Cast Iron Grill Pan and press with a heavy plate so that sandwich is mostly closed. Serve once the cheese melts. 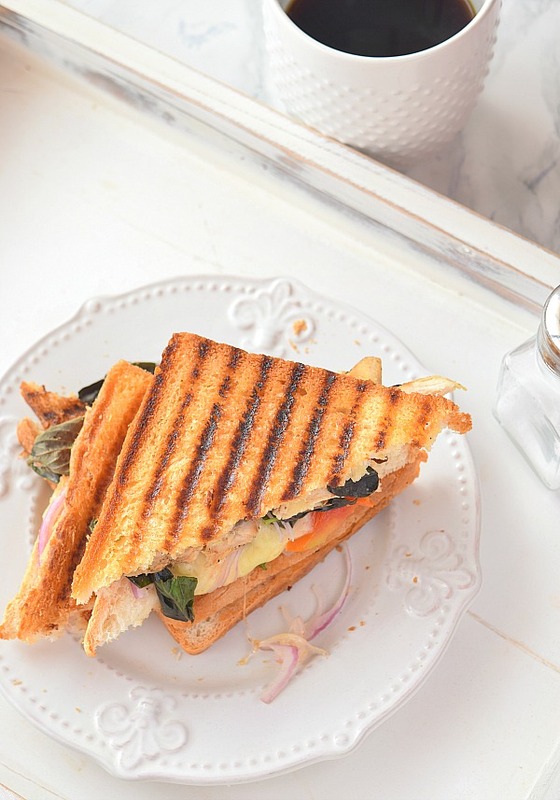 Very easy delicious fix to Lunch /Dinner- Chicken Mozzarella Panini . In a bowl,add the cleaned chicken strips. Marinate the chicken with salt,pepper powder and Italian Seasoning. Add olive oil to a pan,and fry the chicken pieces till done. Let them cool off then cut into pieces. To arrange,place the slices and apply butter on the sides of bread which will be on inside of the sandwich. Add chicken,tomato,onion,basil and mozzarella and close the sandwich. 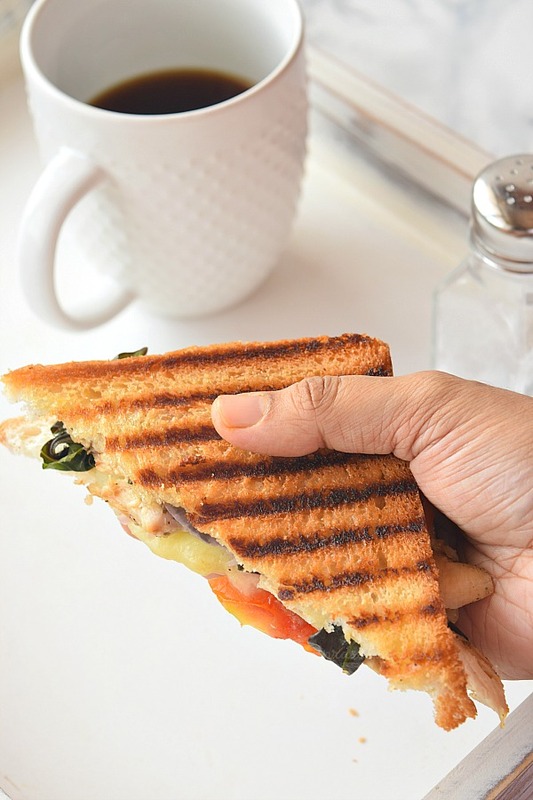 Heat a grilling pan,add some extra butter on the Panini Press Sandwich Maker or Cast Iron Grill Pan ,and cook the sandwich till done and cheese melted. Email me :- savorybites0411@gmail.com or go to Contact Me form to ask for a query or want to subscribe to my posts for free.